Selecting the right base curve is your key to correcting your patient's prescription. 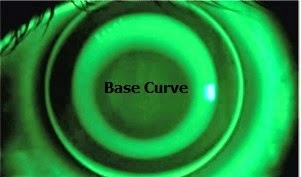 Popular lenses like Paragon CRT have a nomogram tool to help calculate your proper base curve dimension based on the patient's spherical Rx and their flat K reading. The best bet for success also lies in patient selection. Orthokeratology won't work on all prescriptions, so know your best patient candidate to ensure the highest chance for success before you get started. The ideal orthokeratology patient has up to -4.00D myopic prescription and no more than -1.00D of corneal astigmatism. Their K values will ideal be between 42 and 45. It is possible to do orthokeratology on patients outside of this range, but the lens selection will be more difficult, and there is a good chance the patient won't have perfectly corrected vision the next day. Difficult patients for orthokeratology include: against the rule astigmatism (the lens tends to decenter! 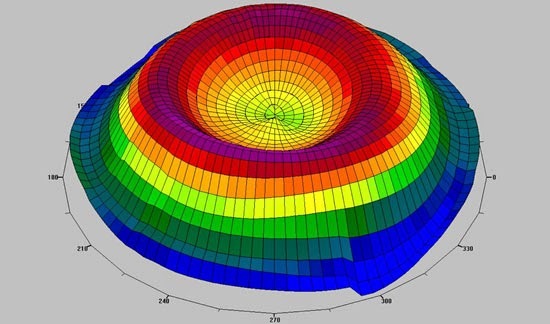 ), very flat corneas (post-LASIK patients would be very difficult), and patients whose astigmatism is greater than their spherical prescription. Also, patients who have lenticular astigmatism will not be expected to have that improve with orthokeratology, so make sure you check your Rx with your K's to verify their astigmatism is corneal. The ideal lens is well centered on the eye with a central treatment zone of about 3-4 mm diameter. You would want alignment staining in the return zone area 360 degrees around, with no bubbles. And on the edge of the lens you would ideally want 1-2 mm of clearance to prevent lens seal off. Read this post for more details and a deeper explanation of each zone. 3) Troubleshooting Fit Issues -- change one of these parameters at a time. Paragon recommends starting with option #1 in the lists provided when changing fit, and then if the issue persists, changing option #2 next. Lens Decenters Left, Right, or Superior? NOTE: If you aren't getting a good treatment zone, double check your over refraction. 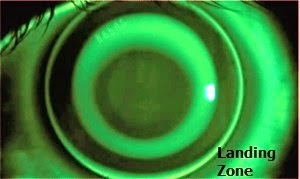 Ideally over top of the contact lens you should get a plano to +0.50 over refraction with no cyl. If there is cyl in your over-refraction over the contact lens, then it is untreatable. If you have > +0.50 over refraction, then Decrease the Base Curve by 0.1 mm for every 0.50 D of correction you need to reverse. Fitting someone with more than -5.00D of myopia? It can be done, but the treatment will take longer, and there is a high chance they may have residual myopia even with the best fit lens. Paragon recommends increasing your Return Zone Depth by 25 microns if you need more myopic treatment, and then have the patient wear the lens for 1-2 weeks and reassess before making further changes. Initial Dispense: Dispense the lens, and have patient wear it overnight and return to clinic wearing the lens the next morning. One Week: Typically we have the patient come in after school, not wearing the lenses. Make sure they bring the contact lenses with them to the visit! Six Months: Typically we are fitting these lenses on growing children, so if they were known to have a high speed of myopia development before their orthoK fit it isn't a bad idea to recheck in 6 months to make sure things are under control. Especially in brand new wearers the 6 month follow-up can help keep things on the right path and instill the concept that the eye is changing and we may need to change the lenses to keep up. The hope is that we have stabilized the eye's myopic growth rate, and the best way to achieve that success is to make sure the lens is properly fitting and fully correcting the issue. One Year: Studies recommend for best chance of myopia control, the lenses should be changed yearly in growing children. The lenses themselves can warp with time, like any RGP, causing less controlled treatment of myopia and a greater chance of myopic slippage.